This week involved a great deal of discussion, a shift in thinking, statement writing and logistic issues. Ally McGinn (2017) Reflection. Paint tube, oil paint, photograph and pencil, 20 x 15 x 7 cm approximately. This piece has evolved over the last few weeks. The source of its creation is hard to pinpoint in a single source. It shows, rather, the development of thought, and a focussing of idea. Documentation of the early stages of this piece can be found in week eight. I feel it is one of the most successful pieces, in an individual sense, created this term (and therefore on the MA so far). It is tempting here to contextually deconstruct this piece, but I find that I am reluctant to. Instead I will leave it here, in a digital space, to allow it its existence. Ally McGinn (2017) Painting [Working Title]. Paint and studio dust, size varies. 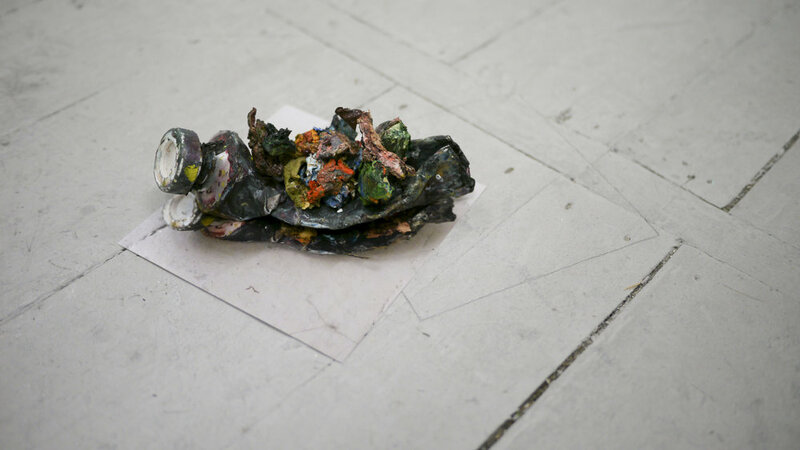 This piece is a large paint skin, with dust collected from the studio over a period of three months. It is placed in such a way as to be ambiguous (although this would change in a gallery setting). Sadly it lived up to it's ambiguity, and was thrown away by a well intentioned anonymous party. There is something beautiful about that interaction. The artwork had a choice based interaction with another person. Ally McGinn (2017) Potentiality. Canvas, paper, paint, ink, pencil and acorn, size varies. This piece speaks most clearly about potentiality. The pencil line on the wall is a line from the smaller piece, but I hope it encourages the small question of, which piece is it hinting at. The colour hidden behind grey (which is the same paint as the floor) is echoed in the materials involved. The colourful piece is a photocopy of an old work, it is stretched around nothing. The grey is traditionally made, with attention to detail, and a single colour. The small seed is leaning between the wall and the work. It has cracked with age, mimicking the edge of the grey canvas. It's potentiality is undeniable and allegorical to the connection between artwork and context. When placed in the installation it connects to the hidden storage of work behind the canvas wall, which also speaks about potentiality. Linking across the space in a metaphysical sharing of context. Ally McGinn (2017) Enframed. Found objects, emulsion paint, gold frame and canvas, 250 x 120 x 50 cm approximately. This piece has been discussed in the documentation of earlier weeks. Like 'Reflection', this piece has evolved through a process of consideration and adjustment. The addition of this week is the painted floor, adding a full-stop to this conversation. Ally McGinn (2017) A New Conversation [Working Title]. Mixed media installation, size varies. The pieces in my work are individual in a sense and yet remain part of a larger whole. If the installation is a conversation, the pieces inside it are sentences, the individual elements of pieces can be seen as words, and finishing the analogy the materials become letters. This analogy leaves a lot to be desired but it serves for the purpose of this metaphor. Ally McGinn (2017) Glitch. Digital print. Three shots amalgamated into one, by my camera. An incidental camera glitch. It's dark and the colouring is terrible for a traditional photo.